Update: We interviewed Philip Winter of Nebia Shower for our podcast! Check out his episode here. In August 2015, Nebia Shower, a showerhead designed to improve your shower experience and cut water usage by 70%, launched on Kickstarter and surpassed its $100,000 goal in just 8 hours. They then went on to double their goal in another 2.5 hours. So how exactly were they able to be so successful? Nebia started their social media efforts about a year before their Kickstarter launch with a goal of spreading the word about the product and raising awareness with the general public. While getting started on social media that early is not always necessary, it is important to tailor social media to your needs. They were already doing promotional events and demonstrations at this point, which means they needed to have social media accounts set up. Their social media efforts paid off and their following grew exponentially, especially on Facebook, which now has over 23,000 followers. The campaign video for Nebia is a bit longer than what we typically recommend; that being said, we advise following Nebia’s method if you are going to have a longer video. To start the video, Nebia engages the viewer by talking about the role showers play in people’s lives and then introducing the problem that is associated with showers. It then briefly delves into how the creators came up with the concept of their product and the process of creating the best prototype possible. This segment of a campaign video is almost always the driest, which is why it is best to keep it concise. The viewer is captivated throughout the video by the narrator’s in-depth descriptions of the Nebia shower experience. Keeping your viewer captivated is critical. The video also shows testimonials from people who have vastly different needs when it comes to a shower- from an AirBnB renter to someone with very thick hair, the video addresses how this shower head can benefit everyone. You want to show how your product can benefit different types of people in order to get the highest amount of backers. The final aspect this video incorporates that makes it wildly successful is that it doesn’t just tell you how Nebia can help, it shows you. By showing the comparison of the eight minute shower with a standard showerhead versus the Nebia showerhead, viewers can feel confident knowing that they are getting a product that does exactly what it says. This campaign page does an excellent job of giving the backer confidence in their purchase. Starting from the top of the page, the title is short, yet describes the product perfectly. You know that this is not just a showerhead that will improve your showering experience, but it is also going to help conserve water. After going into detail about what Nebia is, they then go on to give testimonials from different outlets that reviewed the product. This helps with the previously-mentioned confidence that the customer gains by looking at the campaign page. After the press reviews, the campaign pages explains how Nebia works and what makes it different from other showerheads. This can get very technical and hard to understand but by using infographics, GIFs and images, Nebia was able to simplify it. Nebia wraps up their campaign page with two vital pieces of a crowdfunding campaign, a section to introduce the team and company, and a section about the risks and challenges that go into their campaign. One of the keys to Nebia’s success was the structure of their rewards; they structured this section by quantity, which helps keep it visually simple for viewers. They laid out the rewards for those who were only looking to buy one, then the rewards for those looking to buy two, then three, and so on. In the video, they talked about how they came up with the concept from a gym owner who was concerned with the amount of water used in the showers, so they even included a reward for 15 showerheads for those in similar situations. The prices for these different reward packages range from $249-$10,000, giving the backers plenty of options without overwhelming or confusing them. Nebia also offered a $5 reward for those who want to contribute and get involved without committing to purchasing a showerhead. So what can other crowdfunders takeaway from this campaign? Having a social media presence is key. Videos need to be compelling and engaging. They need to show off the product and demonstrate why the viewer needs it in their life without being overly technical. The campaign page needs to flow in a way that makes sense so that the viewer can find all the information they want easily. You need to instill confidence in your potential backers by providing all the demonstrations, information and testimonials you can. The campaign page needs to say everything about the product in the fewest amount of words possible- potential backers don’t want to read a novel about the technical design of your product. GIFs, images and graphics are a great way to display a lot of information without huge bodies of text. Rewards need to be structured so that the backer doesn’t get confused trying to pick one. There needs to be a reward option for backers in all situations that your product caters to. 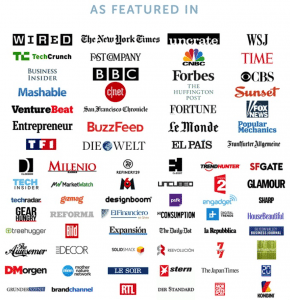 Press coverage helps your campaign to get noticed around the world. For more crowdfunding success stories, tune in to our podcast!